what??? 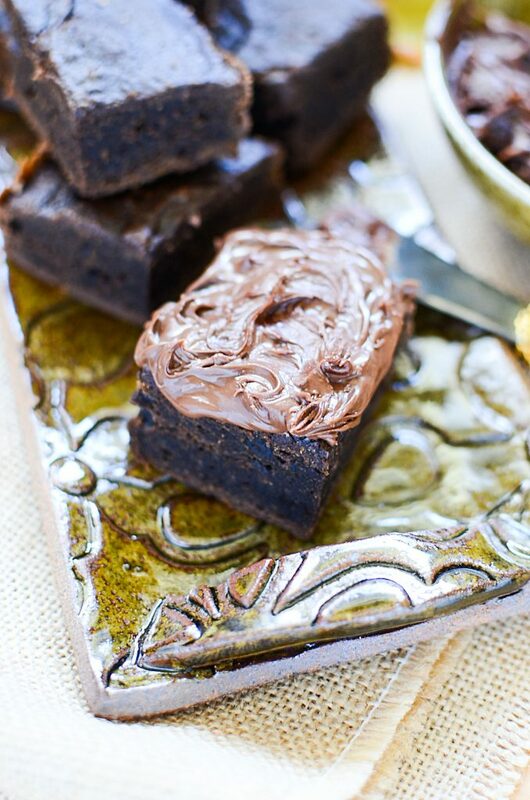 2 ingredient pumpkin brownies?? yes my friend, yes. 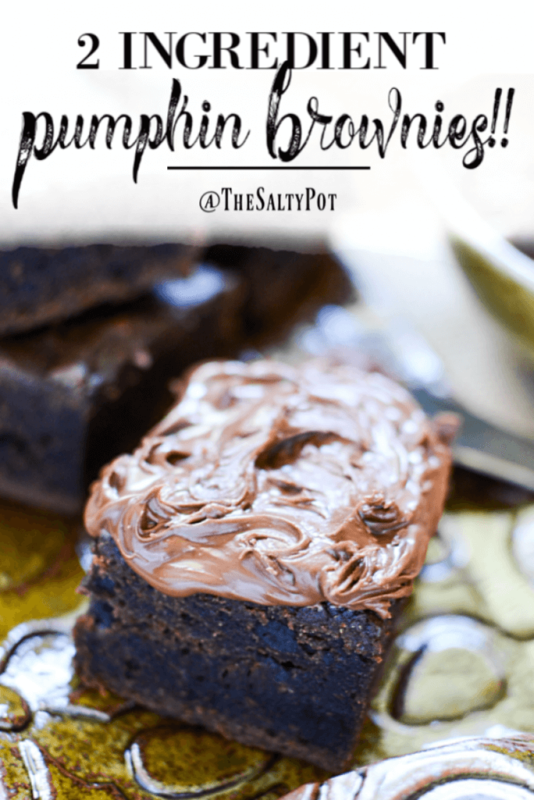 2 Ingredient Pumpkin Brownies!! Yaaay! TWO INGREDIENT PUMPKIN BROWNIES!! Yes, believe it! In the spirit everything pumpkin this season, I bring you another two ingredient, Thanksgiving/fall/pumpkin themed type recipe. Seriously, these amazing 2 Ingredient Pumpkin Brownies makes you want break out the sweat pants and fuzzy slippers, and get ready for the coming hibernation. I’ve tried other minimal ingredient recipe desserts before like my super easy moist CHERRY CHOCOLATE CAKE. .Oh, and remember the CHEATER FRUIT COBBLER? That one as was a two ingredient recipe as well. Both of those recipes turned out pretty damn well, I have to say. This recipe is so crazy easy, you’ll wonder how you’ve gone all these years without making it. 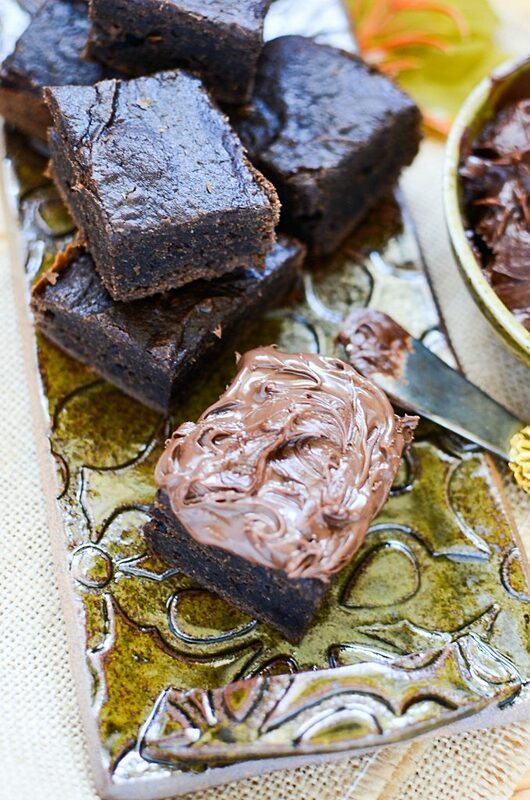 I mean, let’s face it, regular brownies are amazing in their own right…. but a PUMPKIN BROWNIE? It’s over the top. It’s super luscious with all those pumpkin spice flavors that you totally dig this time of year. And to top it off.. IT’S GOT FROSTING. Yeah!! Alright! First up, here’s your ingredients! *NOTE: In the photo above, you’ll see that I bought the 540ml (18 ounce) can because that’s all they had. I weighed 15 ounces and it came to roughly 3/4 of the can. Please keep this in mind when making your own, and adjust according to the can you buy. 1. Preheat your oven to 350! 2. Empty the box of brownie mix and about 15 ounces of the pumpkin pie filling into the cake mix and mix together. I know, pretty difficult so far, right? 3. Now, this is optional, but I happen to seriously love anything pumpkin spice. So you can add up to a teaspoon of pumpkin spice to the mix to “make it sing”. ( I DESPISE that term, but it’s really the only word I thought appropriate to explain what I”m trying get across). 4. Next, pour the mixture into a parchment lined 9 x 9 or 8 x 8 pan. No parchment? Grease the hell outta the pan, and you’ll be fine. I found that I had to bake the brownies for a good 45 – 50 minutes, so you might wanna keep an eyeball on the pan just to make sure it’s baked thoroughly. Start testing the brownies at the 45 minute mark. No one likes raw brownie dough…… I think anyway. Maybe it’s like a raw cookie dough concept? Meh, not for this chick – I like my baked desserts… BAKED. When a toothpick or knife inserted comes out clean, you’re good to go. Let cool COMPLETELY before you decide to frost or sugar these babies. Ok. So let me tell you, this isn’t your typical brownie. It’s more dense, and has a soft pumpkin flavor mixed with the chocolately goodness of the brownie. Be warned though, my gorgeous reader. 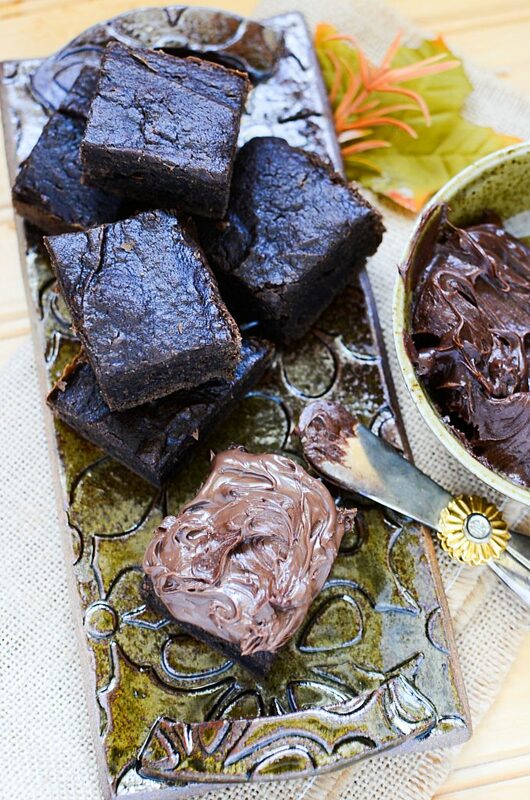 If you like the flavor of chocolate, this chocolate brownie with the chocolate frosting can quell any chocolate craving you might have. HOWEVER, the denseness of these brownies from the pumpkin seem to almost intensify the chocolatey taste to the point that well,… it’s teetering on craziness. I ADORE chocolate, and ONE small brownie with the frosting was enough to lull me into sweet, dreamy chocolate pumpkin land, where one might be tucked into their chocolate pumpkin brownie bed and given chocolate pumpkin brownie kisses and yummy chocolate hugs sprinkled with warm pumpkin spices. Luscious. Chocolately. Pumpkiny. Dressed all up with the chocolate frosting. It's impossible to fathom that this amazing 2 ingredient pumpkin brownie dessert was made with .. .well... only two ingredients. Add the pumpkin pie spice if using. Mix well. Bake in the oven for 55 minutes or until completely cooked through. Remove from the oven and let cool completely. Frost the brownies with the icing that came in the box.